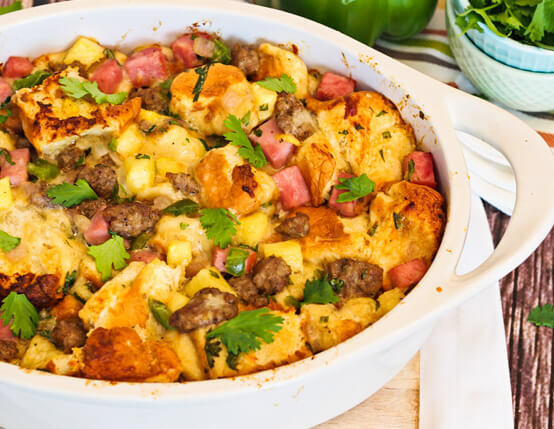 The flavors of the islands blend together in this side dish featuring sweet Hawaiian bread and Jones ham and sausage. Preheat oven to 350°F. Add sausage to large sauté pan over medium heat; cook approximately 8-10 minutes, or until meat is cooked through. Use wooden spatula to break sausage into crumbles as it cooks. Transfer to medium bowl and set aside. Using same pan, sauté green pepper and onion, using juices created by browning meat. Add poultry seasoning, salt and pepper, stirring to combine. 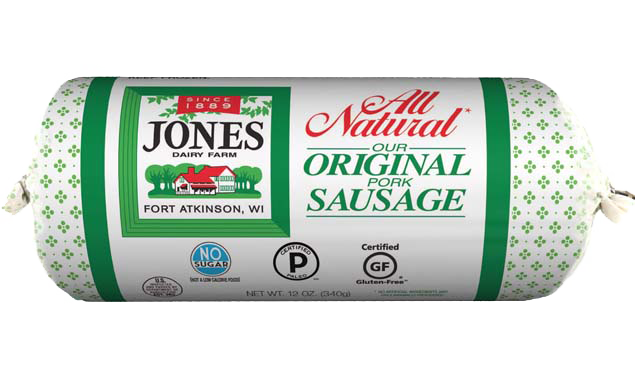 Add cooked sausage and ham, stir. Remove from heat and set aside. Transfer mixture into large bowl and add egg whites, chicken stock, pineapple and mozzarella cheese. Stir well. Add cubed bread and stir slowly to combine. If mixture is too dry, add more stock. If mixture is too wet, add more bread. Pour mixture into 2-quart casserole dish and cover. Cook covered 45 minutes; uncover and cook another 15 minutes or until bread is toasted and dish is bubbly. I like to contribute a non-traditional stuffing recipe to our family thanksgiving gathering every year and this one didn't disappoint. Everyone was asking about it. I did add more stock because the recipe seemed dry when I was mixing it, but in hindsight I should have left it as is. The Hawaiian rolls add more moisture than traditional bread would so extra stock isn't necessary.